When I booked my first styled shoot for my cake business, Aspen Charm Cakes & Pastries, I was thrilled!! A photographer who I adore asked me to make a cake for a shoot and I loved the concept of the entire vision. From there, I’ve booked several styled shoots that have been published and have truly helped transform my cake business. 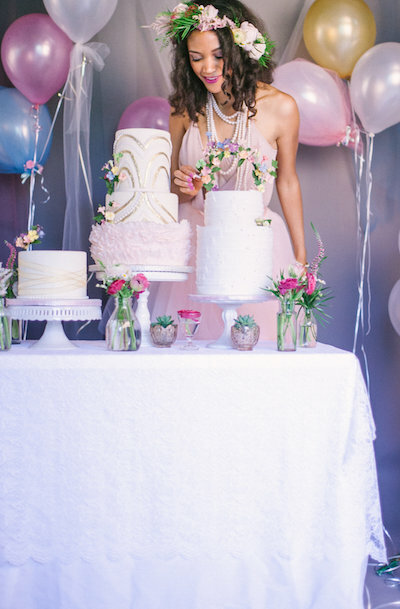 Styled Shoots do sooo much for your cake business. You get professional images of your work, you network with people in your area and industry who can refer business to you, and you have more cakes to add to your portfolio. It’s a win, win, win in my book! And even though you may be making a “free” cake, the rewards far outweigh the time that goes into the shoots. If you are looking to book more styled shoots, or your first, here are my top tips to help you get booked! 1. Introduce yourself and build relationships. No one knew I existed in Denver, CO. when I started to grow my cake business. Therefore, no one asked me to participate in a styled shoot. Which means if you want to you want to book more shoots you have to get your cake business out there and network with the industry professionals who usually put on the shoots, wedding planners and/or photographers. As you are developing your relationships with these professionals, ask them if they do any styled shoots. If they do, LET THEM KNOW that you’d love to be part of their next styled shoot. Most cake designers don’t do this step, they sit around and wait for opportunities when those who make things happen, make them happen! You will be at the top of their mind when it comes to asking you to participate in the next styled shoot! 2. Know what kind of shoots you want to book. I’ve participated in styled shoots that stretched me outside my design comfort zone. Which is something I welcome, it helps me design different styled cakes. However, I’ve been asked to participate in some styled shoots that didn’t align with my design style and I knew it wasn’t going to be a great fit. Before you say yes to a styled shoot, look at style board and really ask yourself if you can see yourself creating a cake for this shoot. If you aren’t that excited about it, I’d say pass on it. Tons of professionals are putting on styled shoots in your area. It’s okay to say no that doesn’t light you up. Plus, when you are already busy in your cake business, participating in a styled shoot may not be the best use of your time. 3. Go to Networking Events. I started to spread my cake business name by personal networking/outreach and by going to industry networking events. In Denver, there are tons of these events where wedding industry professionals get together and network. When you start to go to these events, you start to meet new people in your industry and you begin to build your network. Again, ask the professionals if they participate in styled shoots and let them know you are interested and excited to participate in a styled shoot as well! 4. Have an open calendar. This is an energetic step that will help you receive more requests for shoots. If you are way to busy with your personal life, cake business, and you never have time to work on something extra, it’s going to be hard for the universe to send you styled shoot requests. You don’t have the time to add anything now! Create space in your calendar for more cake orders, styled shoot requests to flow into your cake business. Add more systems and structures in your cake business to help make your business run seamlessly. This way, you will be more open for more orders to flow into your life. Do you have any questions about booking styled shoots? Comment below and I'll help you out!